I founded Namaste in Nature in 2017 to provide a fun, safe, unique & sustainable experience for both mind & body. I welcome everyone including beginners to enjoy a respite from modern stresses, anxieties and routines while celebrating and appreciating nature. I have practiced yoga since 2008 and completed my RYT® 200 Yoga Teacher Training in traditional Hatha style yoga at Ayur-Yoga Eco Ashram in Southern India. I have led or participated in international classes and training across North America, South America, Australia and Asia and also currently also teach studio classes at Asheville Yoga Center. I believe yoga is for every body and should be accessible to everyone. I offer multiple options for each asana in the practices I guide so that they are inclusive of everyone from beginners to experts. Before moving to Asheville and starting Namaste in Nature, I was an art director at Whole Foods Market and an international advertising agency. I am currently an independent creative consultant, specializing in the natural & organic food industry, responsible travel/tourism and wellness/yoga. I also love cooking healthy, plant-based meals, international travel/volunteering and learning how to live a more mindful and sustainable lifestyle, which I document on youtube and instagram. I am an RYT® 200 certified yoga instructor who specializes in teaching Hatha yoga, yin yoga and meditation. My classes focus on present awareness through noticing and moving (or holding) the body with relation to the breath. Through my traveling yoga business, Yoga Nut, I teach with compassion for my clients and believe we must take care of our physical, mental and spiritual selves to be truly healthy and balanced. I enjoy reading, spending time in nature and drinking coffee. My yoga journey began as a senior in high school as a way to better my athletic performance as a basketball player. At the time, I never knew how much yoga would change my life. Through yoga I learned that my body was capable of many things–it’s a very powerful machine. I learned that despite the preconceived notion that most have, there is more to yoga than flexibility. To me, yoga is about mental, physical and emotional balance, which inevitably leads to self-improvement across all areas of your life. I received my 200-hour Yoga Alliance Certification in July 2018 through Asheville Community Yoga with an additional 50 hours towards my YTT. As an instructor, I want to teach yoga to people striving to live an active lifestyle, whether that be through sports, hiking, bodybuilding, swimming + more. When I practice yoga I learn about balance. I allow myself to sort through the chaos of working 9-5 everyday, balancing the responsibilities of eating well, maintaining an active lifestyle, taking care of myself, having a social life, and being a dog mom. Despite your daily flow, everyone could use a little yoga, and I want to invite others to find theirs. Teaching was Tara’s dharma long before she realized it. She grew up with a bow and arrow in her hands, learning to pull back with just enough aim and control to send her arrow into the abyss, knowing and trusting it would hit its intended mark. And so she enters each class, each workshop, each lesson.. Having prepared her body and mind to become that bow - that vessel - that let’s her lesson go.. Weaving its way into the provided space and landing wherever it is intended. When you practice with Tara, you get more than a teacher on the mat; you gain guidance for your daily life. Inside the studio, no two classes or workshops are ever the same. Students are not told what to do, they are empowered to listen to their own bodies. Tara recently moved to Asheville from Richmond, VA, and is ERYT200, ERYT500, RCYT, YACEP and a Certified Coach and Mentor. Yoga has been part of my life for over ten years and my practice has helped me build strength and self confidence both on and off the mat. I completed my 200 hour YTT in 2018 and I am grateful for discovering a path to mindfulness that I can share with others. My classes combine creative sequencing perfect for any level student to nurture your mind, body, and soul and leave you feeling balanced and refreshed. When I'm not in down dog, you can find me on the hiking trails as an advocate for Leave No Trace and the Carolina Thread Trail. I have always felt a calling to teach, long before I even knew what it was I was supposed to be teaching. When yoga became a profoundly transformative part of my life, it was a no brainer to complete my 250 hour teaching training with Asheville Community Yoga. I have since found deep joy through sharing the practices of yoga and meditation in the Asheville area. I have also worked as a teacher in the Spanish classroom, in whitewater rafts and in various outdoor guide positions in these sweet blue mountains. When weather permits, my own yoga practice takes place outside more often than inside. There is nothing I would rather be doing than riverside asana or mountaintop meditation. The opportunity to sync the body and breath with the natural rhythms of the earth is deeply healing, grounding, and brings me peace like nothing else can. I am over the moon to teach yoga under the open sky, offering others the opportunity to settle into the sweetest part of themselves as they move, breathe and unwind with the earth. John has gone from former U.S. Marine to Wilderness-based addiction recovery guide offering connection and motivation for those starting on a new path. Along the way he has led hundreds of classes for 6 years including 6 semesters of Yoga for Health at Indiana University and at the University of Notre Dame. He loves both hiking and yoga as both are best done immersed in the scenery of the great outdoors. Let John accompany you to beautiful places in the mountains, in your mind, and in your body. 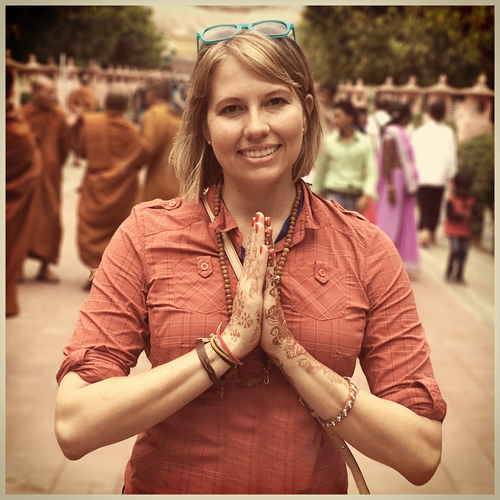 Abigail has been practicing yoga for about 10 years now, and through her yoga journey has cultivated a sense of connection to herself and the beings & world around her. She believes strongly in the transformative and strengthening power that nature has to offer. Abigail is a RYT-200 who practices mainly vinyasa yoga, but has also received training in yin and prenatal yoga. Her teaching style focuses on mindful body, drawing awareness in postures and encouraging exploration through micro-adjustments. When she's not on the trail or the mat, you can find Abigail enjoying a craft beer and hanging out with her dog, Juneau. All guides are certified in CPR, First Aid & AED, have completed RYT® 200 Yoga Teacher Training and are members of Yoga Alliance.